This high capacity 1200-ml dispenser is ideal for high traffic areas. Gojo Smart Electronics technology minimizes energy use per actuation, eliminating need to change batteries over the life of the system in most installations. Large sight window, skylight and clear refill bottles make it easy to check fill status. Controlled collapse refills hold their shape as they empty for a more attractive appearance. Easily converts to locking dispenser. Removable pump makes recycling easy. Sanitary sealed refills made of durable, recyclable PET material, using 30% less plastic than rigid HDPE bottles. Fully ADA compliant. 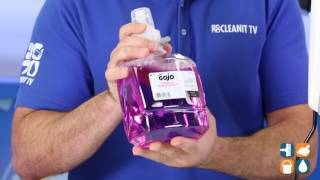 Best of all, this Touch Free Soap Dispenser comes with Gojo's Lifetime Performance Guarantee, including batteries.